Survey apps tend to be hit or miss with me. But when I discovered this one while researching ways to make extra money online, I had to give it a try. 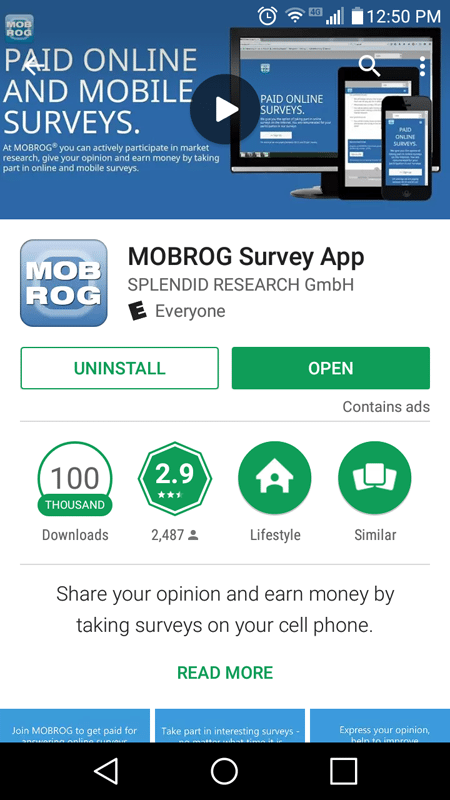 But can you really make money with the Mobrog Survey App? This was the question that I was determined to answer—and obviously, I never let these types of apps go without giving them a good old-fashioned try. Most survey apps tend to be tedious, take far too long to complete for the money, and sometimes just ask you to do a lot of really ridiculous things. Many times, they don't provide enough surveys to make it worth it. However, I was ready to be impressed by Mobrog. Will they break the trend and be a good pick? Check out what happened when I downloaded and tried it. Alright, here is what I found when I first opened up the Google Play Listing for the app… and to put it quite plainly, things were not looking so good. The app had been downloaded over 100,000 times, which was good… but its Google Play Rating was only 2.9 stars, which was not. I have found that apps with a rating of fewer than 3.5 stars are much less likely to work out… but I have also found exceptions to this rule (not many—but some). But that’s not all. Take a look at how the reviews were stacked up. Look at all of those 1 Star reviews. That is certainly not a good thing to see when cracking open a new app. I don’t think that I have ever seen an app with more 1 star reviews than 5 star reviews that worked out… but once again, I never judge an app based just on what I read in the Google Play Store. I don’t like to base my first impression on what other people have written or said—so I went ahead and decided to try the app out anyway. Opening up the app brought me to the sign-in screen. But since I didn’t have an account, I went ahead and began the registration process (there was a registration button down below the sign-in button). Here is a screen-shot of the top of the registration screen. A lot of apps like this will let you log in with Facebook to start using the app. But I had no such luck with Mobrog. I had to do this the old-fashioned way—by literally filling out the forms. 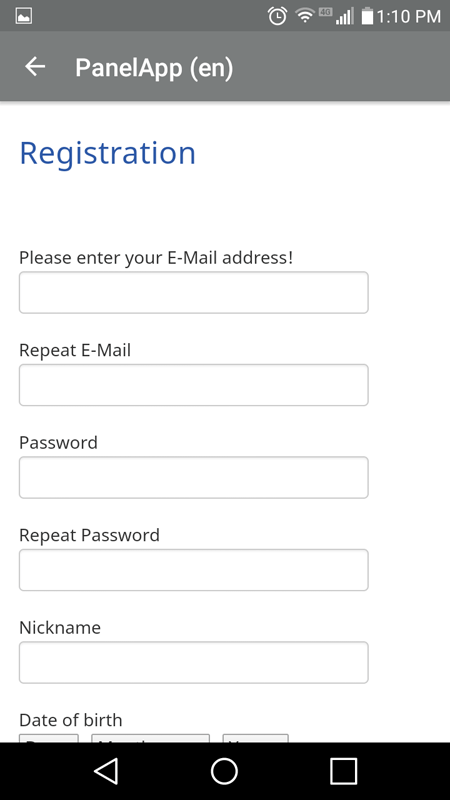 I guess this seems a bit outdated to me in an app world where the forms are usually auto-filled for me through the use of a Facebook Login—but that’s ok. It’s really not that big of a deal. Here is the page I arrived at after I finished filling out this registration information. Just as promised, the email came right away. 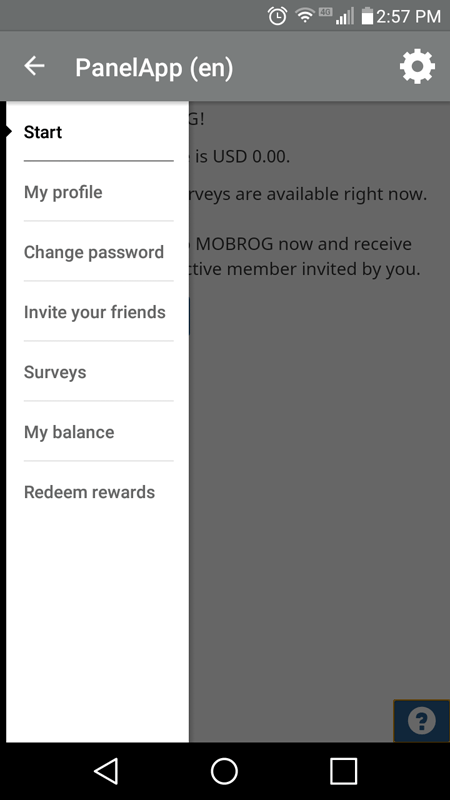 I had to activate my account by clicking on the link, but that was easy—and I was immediately taken to what seemed to be the Mobrog App website, where I could view my account balance and some other bits of information. But now that my account was activated, I was pretty excited to get back to the main app. I was hoping to find some surveys to complete, so that’s what I worked on next. Lately, a lot of survey apps that I’ve been looking at have failed to provide much in the way of surveys… which is ironic, because that is what they’re supposed to be about! I found myself hoping that this wasn’t going to be one of those cases. Would I Be Able To Find Some Surveys To Take On Mobrog? When I first logged into the app after registering and activating my account, this is what I found. It seemed very simple, and it looked like I had an introductory survey that I could take. So that’s what I did next. This survey was basically one of those intro-surveys you take that qualifies you for certain types of surveys later on. Or at least, that’s what it seemed like. I took the survey. It was a bit lengthy, to be honest. They asked me a lot of standard questions, about home ownership, how big my family was, how much our income was, what kind of car we drive, what types of electronics we use, etc. They all seemed like pretty standard survey placement questions to me. 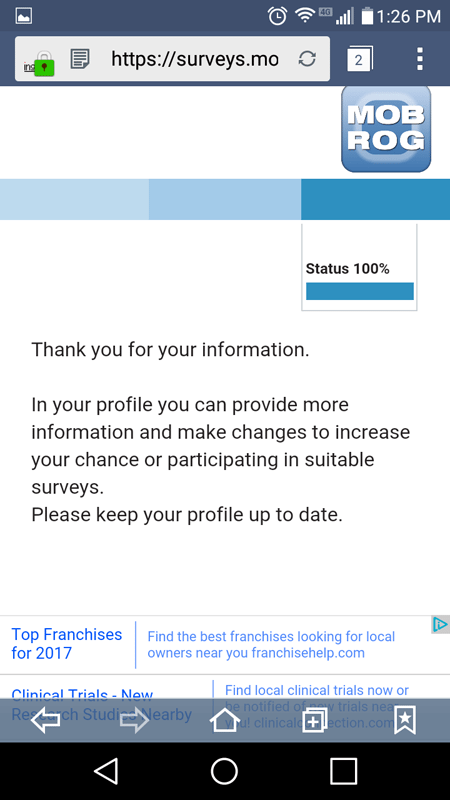 At the end of the survey, I was taken to this screen. Next, I was taken back to the hub of the app, where I was told that no surveys were available right now. I was given the opportunity to invite my friends to the app, and was told that I would be awarded $1.25 for each friend who joined and became an active member. But I was still interested in going through the rest of the app, just to see what was going on. So that’s what I did next. There was a little blue question mark in the bottom corner of the app that took me to the company’s website when I clicked on it, as well as a settings icon at the top right-hand corner of the screen. There was also a drop down menu with some other options for pages within the app that I could navigate to. But aside from that, there really wasn’t anything else to look at. This app is super, super basic. It almost reminds me of a spreadsheet. It’s just like a white background with basic text and non-fancy buttons. I am all about simplicity, but this app was almost too simple—even for me. But this didn’t really help me to figure out how to earn any money with it. I am not sure why I didn’t have any surveys. It could be because of the area I live in, or it could be because I just didn’t qualify for any… but rather than assume, I decided to hit the Google Play Reviews for some information before I concluded my review. Were other users getting plenty of surveys? That’s what I wanted to know. 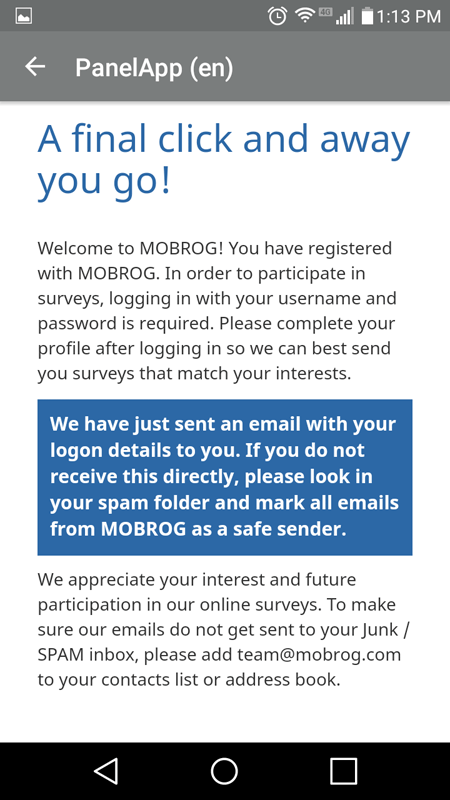 Alright, after reading through quite a few customer reviews, I have come to the conclusion that I am definitely not the only one who is not getting surveys from Mobrog. In fact, most of the latest reviews are super negative. 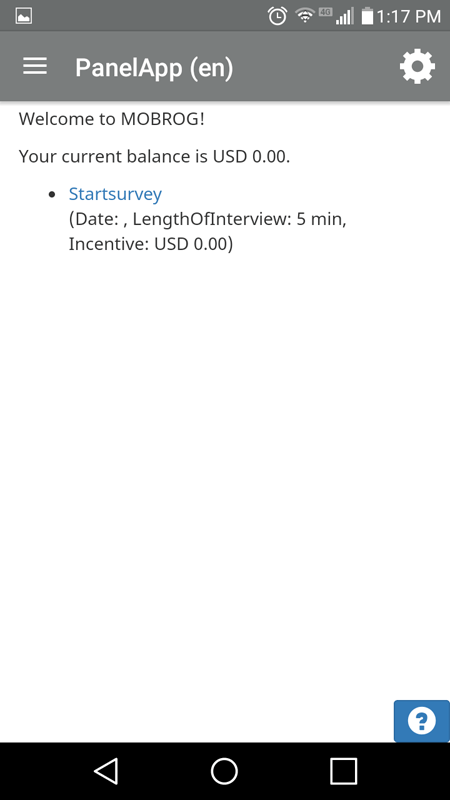 People are not only saying that they don’t get surveys, but that when they do get surveys, they are often not accepted, and the users often don’t get paid for them because of that. I did read a few reviews that seemed to indicate that there were instances where people made some money from the app, but these were very few and far between, and certainly were not very common place. It was also difficult to determine what a lot of the surveys paid out judging just by the reviews… but from what I can figure, they paid out less than $1 a survey. But again—it was really hard to figure that out based on what I read of the reviews. I didn’t read all of them… but I did scroll and read for several minutes before getting overwhelmed with the negative reviews and just calling it quits. At any rate, at this point, I figured that I had learned enough to make a choice about Mobrog. In a word, I was disappointed by this app. I didn’t really gain a single thing from signing up for it. Admittedly, I didn’t have it for very long before writing this review—but I still never received a survey, or much less, any money for my time. And according to the reviews, it really didn't look like I would have much of a chance of earning more cash with it or getting more surveys in the future with it, either. I don’t usually tend to be a big fan of survey apps in general. But if I were going to choose one, it would definitely not be this one. Sorry Mobrog, but I feel like there are better ways to earn extra cash. Is this offer is now available?